HONG KONG, May 19, 2017 - (ACN Newswire) - The ninth edition of the HKTDC Entrepreneur Day opened today to a record of more than 270 exhibitors. 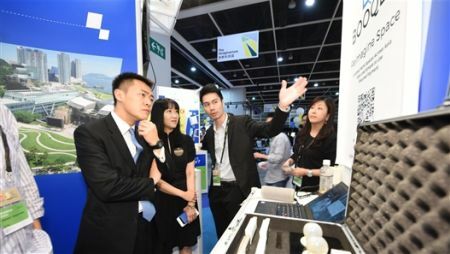 Organised by the Hong Kong Trade Development Council (HKTDC), the two-day event (19 to 20 May) is taking place at the Hong Kong Convention and Exhibition Centre and is open to the public for free. "The event is the HKTDC's flagship event for entrepreneurs," said HKTDC Executive Director Margaret Fong. "As more and more young people become interested in entrepreneurship, their demand for start-up support is continually rising." Lau Ming-Wai, Chairman of the Commission on Youth, officiated at this morning's opening session of Start-up Runway. Entrepreneur Day's two-day flagship conference kicked off with a plenary session titled "Vision Explorer: Venturing into the Future". Among the speakers who shared their entrepreneurship experience were Simon Loong, co-founder and CEO of WeLab Holdings, one of the world's top FinTech companies (ranked 33rd globally and sixth in China); Terence Kwok, co-founder of Tink Labs Ltd, which raised US$100 million in a recent funding round; and Shing Chow, founder and CEO of Lalamove. The forum was moderated by StartupsHK's co-founder Gene Soo. More than 40 seminars, workshops and networking activities will be held during Entrepreneur Day, featuring entrepreneurs and start-ups from different sectors who will discuss innovation and technology trends and start-up opportunities, offer professional advice to fledgling entrepreneurs and share experiences and insights. Speakers will include Carman Chan, Managing Partner of Click Ventures, which provides mentorship to companies specialising in Internet, mobile and related technologies (its portfolio includes Spotify and Meetup); Samson Tam, Partner of Hong Kong Innovation Angel Investment Ltd, an active angel investor that has invested in more than a dozen start-ups; Jason Chiu, CEO of cherrypicks, whose entrepreneurial journey was featured as a Harvard Business School case study; James Hong, renowned travel writer; Antonia Li, Research Analyst of Oddup; and Alex Kong, founder and CEO of TNG Wallet, Hong Kong's home grown eWallet. A diverse range of hot topics will be examined at the events, including Fintech, AI and TravelTech. Creativity, sound planning and market intelligence are key components to every entrepreneurial success. This year's Entrepreneur Day features a new exhibition zone called The Imaginarium, which gathers more than 60 start-ups to showcase the latest innovative products and technologies in the fields of health technology and biotechnology, FinTech, greentech, IoT (Internet of Things), artificial and augmented reality (AR/VR), artificial intelligence (AI) and robotics. A number of local tertiary institutions and tech companies are also on site to showcase their work. Visitors can experience the latest innovative technology and creative concepts from different sectors and technical domains at the zone. Visitors can see various tech innovations and systems in action at the Imaginarium Demo Area, which will showcase start-up cases and live demonstrations by tech and tertiary institutions and co-working spaces, including the Hong Kong Cyberport Management Company Ltd, The Chinese University of Hong Kong and playground.work. Other highlight zones include: Go-getters Zone, which showcases business opportunities for start-ups; The Boosters, where support services are offered; The Cosmopolitan, which features start-up cases from overseas and the Chinese mainland; and Creatopia - Cross Matching Pavilion, a platform that promotes local creative designers and cross-sector business cooperation. For start-ups to thrive, capital is crucial, and pitching is one of the main ways for start-ups to seek funding. This year's Pitchathon is co-organised by StartHub, the Hong Kong Startup Council and Cocoon. The event aims to provide start-ups and investors with an exchange platform where start-ups can hone their pitching skills and seek funding and compete for a chance to secure angel investment. At this year's StartHub 3.0 Pitching Competition, winning projects have the chance to receive up to HK$20 million in funding. Building connections is another indispensable component of entrepreneurship. Entrepreneurs need the support of like-minded peers and expert advice. At Entrepreneur Day, the HKTDC together with the Hong Kong Federation of Youth Groups has organised the Start-up Mixer, a two-hour event that uses the "speed dating" format to allow more than 70 start-ups to interact with 12 star mentors from different sectors and receive business advice. In addition, the HKTDC is co-organising the Startup Weekend Hong Kong Bootcamp with Startup Weekend Hong Kong. The event allows fledgling entrepreneurs to compete with each other and experience the entrepreneurial journey, brainstorm ideas and turn them into viable businesses. Another new event, The Pioneer Meetup, offers a platform for start-ups to exchange ideas with young leaders and successful entrepreneurs. The HKTDC is also launching an event with W-Hub, called Start-ups Meet Talent, which allows start-ups to meet prospective teammates, conduct interviews and hire staff. Meanwhile, the acclaimed Fund & Mentor business-matching event returns, offering an opportunity for start-ups to explore cooperation with potential investors.